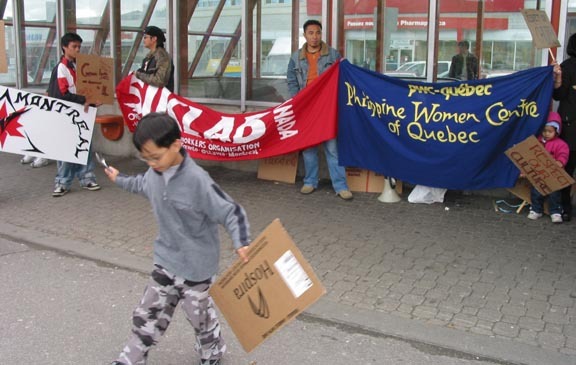 Over 80 members of the Filipino community and their supporters demonstrated in Cote-des-Neiges, the heart of Montreal's Filipino community, to support Luc Cagadoc and his family. Seven year old Luc Cagadoc was punished unfairly for eating his food with a fork and spoon, a customary way of eating for Filipinos. The Cagadoc family was also present during the march. Theresa Gallardo, mother of Luc Cagadoc, said, "We are so happy to see our Filipino community support us, it gives us inspiration!" Until now, there has been no move on the part of the Marguerite-Bourgeoys school board to apologize for the incident. 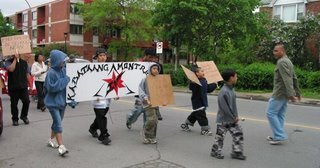 "There is a need to demonstrate to show that, as Filipinos, we demand that our children are respected and are accessing quality education," says Emmanuel Macarine, member of Kabataang Montreal, a local Filipino youth organization, "our voices must be heard and it has to be known that this cannot be tolerated. Throughout the march, demonstrators chanted, "Immigrants in, racists out!" and "C-S-M-B, we demand apology!" and collected over 100 signatures in their petition demanding a public apology to the Cagadoc family and a racism-free environment for their children. "In a country that prides itself on being multicultural, we should not be forced to conform our eating to the dominant, colonial, and imperialist culture," states Rodney Patricio, member of Kabataang Montreal, a local Filipino youth organization. 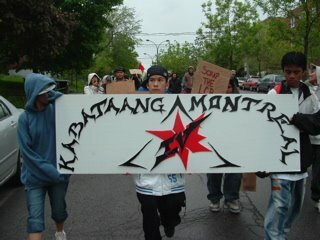 "Closed doors lock out the community," states Aaron Santos, member of Kabataang Montreal (KM), a Filipino youth organization, in response to the news of a private meeting between selected members of the community and the Marguerite-Bourgeoys school board (CSMB). "This meeting does not engage our community and none of our questions or requests will be responded to," says Rodney Patricio, spokesperson of KM. "It will only further divide our community." 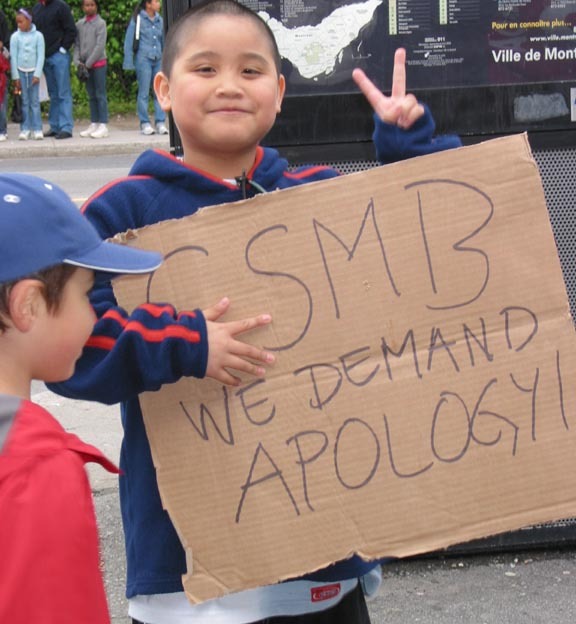 After trying several times to contact the CSMB about having a public meeting, the school board was tight-lipped about any of their plans to address the incident with Luc Cagadoc, a seven-year old boy was harrassed and disciplined for practicing his cultural eating habits. "This is completely unacceptable for an institution to deny the obvious racism that exists within their system," says Santos. "Where they should be apologetic for their actions, they just continue to avoid any accountability on their part." and a guarantee to a racism-free environment in the education system. corner of Victoria and Van Horne (Metro Plamondon). All are welcome to attend - bring your forks and spoons! For more information, contact Rodney or Joy at (514) 678-3901.
that Cagadoc's eating behaviour may not have been intelligent. many of us feel and experience each day. 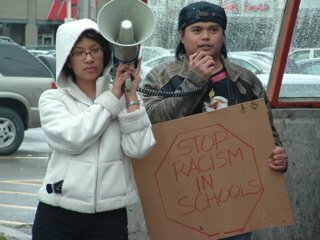 schools since many Canadians have diverse cultural origins. living and working in Canada. education is accessible for all. Access for all to quality education! Genuine equality and development for all! 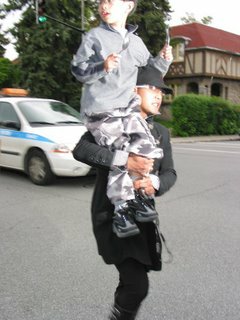 the boy's family has filed a complaint and made the incident public. community. We will not accept this without a fight." community organization a letter threatening a libel suit. (Métro Plamondon) on Sunday, May 21st, at 5:30pm.